Would you like to buy this for less than a dollar and free shipping? Of course, you would. But most unsuspecting people will pay $20.00 for it and pay for shipping too. Why? Because they think they are really helping to save turtles. Only 10% of PROFITS are donated to various charities by Ocean & Co. They get to deduct THEIR donation to the charities from their taxes and you don’t. Why, because you gave to a BUSINESS. You made a purchase of a bracelet. YOU did not donate, THEY did. Now let’s look at what you could have done. You could have gone on Ebay or Aliexpress and bought the bracelet for less than a dollar. The rest of your $20.00 could have been sent to a legitimate charity and you could deduct YOUR donation from your taxes. You would have given $19.00 to the charity instead of less than $2.00. What a difference that would make to the charity if everyone did that instead of what people are doing. What is the true “Cause” here? The true cause of businesses like Ocean & Co and 4Ocean etc. is to make themselves rich. You may be thinking, well, what’s wrong with that? The problem is this is a very deceptive way to do business. To me it’s criminal. It’s preying on the sensitivities of people who genuinely care about the “said cause” which in this case is saving turtles lives. These “cause” businesses mask that you are really doing very little to help the turtles, nor are they. If you look at the mission statement for Ocean & Co, you will see where they put down 4Ocean for what they do to try to make themselves look more legit. As I’ve said before, I hate deception. In any form. To me, this is as are all cause businesses that are not upfront about what they are doing and transparent about their giving to charities and their profiting for themselves. Below is an anklet sold by Ocean & Co. As you can see, the price is $17.99. Below you see the same bracelet. From .66 cents to $1.65. This is true. Companies like Ocean & Co buy it for probably less if they are buying in bulk. Or maybe they are paying the listed price and having it drop shipped. No shipping cost to them. Easy peasy. And they tell you “Thank you for your SUPPORT.” I say they should be saying, “Thank you for your BUSINESS!” Stop the deception! You can Google “Turtle Rescues” and find many. One that is in Marathon, Florida is owned by Richie Moretti. A local businessman that used to sell Volkswagons in Winter Park, Fl who sold his business and bought a small motel in Marathon, Fl in the Keys. He later turned it into a turtle hospital and rescue. He has been on Sea Rescue many times and you have probably seen him on Saturday mornings on your tv. You can give to his turtle rescue and I’m sure it would be oh so appreciated. Please also see the blog post about 4Oceans here. Thank you for taking the time to read this. And please feel free to share. Please make your donations really help! Don’t buy cheap Chinese jewelry to give a business a big profit that benefits saving turtles very little. Thanks. I hate deception. And when I see it, I usually have to talk about it. millions. And please note, they are NOT a charity. They are a for-profit business. out of China with vendors that make bracelets for pennies and sells them for under a dollar. 4Ocean figured out that they can imply that they are saving the ocean, the turtles, the whales, you name it and charge $20 bucks for these bracelets, plus shipping and make a handsome profit. and pick up a little bit of garbage and they would be even more valid. An estimated 14 billion pounds of trash-most of it plastic -is dumped in the world’s oceans every year. Think about that and how much of an impact one pound of trash is being pulled (picture a can of soup), from the ocean times only millions is doing. I’m thinking at a rate of 14 BILLION pounds per YEAR – this is nothing! It’s like trying to empty the bathtub with a thimble as the faucet is running. Ludicrous! Anyway, back to 4Ocean, from there they blossomed, (meanwhile raking in more and more money) getting a captain for a boat, flags, and other paraphernalia with their name on it and soliciting volunteers who would gladly help them. After all, they were helping to clean the ocean. From what I understand they take their hauls of trash and sell them for even more profit. for every bracelet bought.” You have to wonder who is keeping track of that. to you if you will sponsor us.” I’m sure there has to be something like that. a difference. Remember, 4Ocean is NOT a charity. As I was writing this and looking at 4Ocean’s “shop,” I saw that they are selling water bottles with their logo on them too. So I went searching for the water bottles to find out how much they cost, when I stumbled upon another company doing the same thing 4Oceans is doing only they will plant trees and they are not the only other cause business, there must be tons! I’m remembering the sock business that donates socks and there is a cuddly animal or doll business that donates meals to starving children. I’m telling you this is a lucrative business! It’s called a “Cause” business. And inherently there is nothing wrong with attaching a cause to your business. People like that. The problem is when you decieve people by what you are doing. And that’s how 4Oceans started out and continues to do in some fashion. You know, as long as you give some small portion to the cause that you claim you are helping, you can do this too. You don’t have to be a charity yourself. Genius, Suckers! Please help to rebuild Jim’s Wildlife Sanctuary and his home. Jim is an amazing person. He has a deep love of all animals and an unquenchable spirit of love and kindness to all. He humanely traps animals to help fund the sanctuary and is an accomplished artistic painter which also helps him with the sanctuary and his livelihood. Recently there was a terrible fire that burned Jim’s home on the property and killed many animals. Jim was asleep when a peacock began squawking which woke Jim up. He was only able to rescue one of his pet dogs that slept with him. Many animals were in cages below the two-story home that sat on stilts. They all lost their lives. Jim lost everything. His clothing, phone, computer, painting supplies, you name it. He was left with just the clothes on his back. Although Jim has lots of support, it is going to take a lot to rebuild. And even after that the sanctuary will need to be funded. 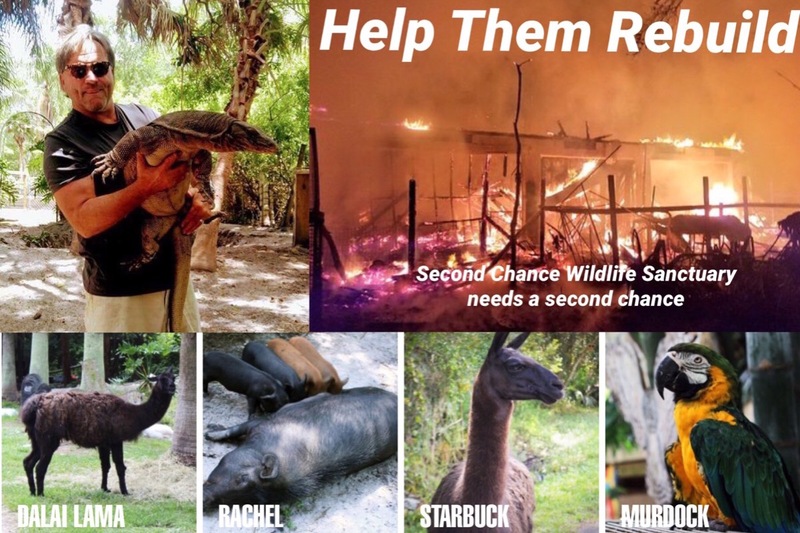 If you can donate, you can donate through the above GoFundMe account or through Jim’s website at: http://www.secondchancewildlifesanctuary.org – Thank you! Joel Rosenthal is living the dream most of us dream of. Living with wildlife. Joel tirelessly works every day to save the lives of injured and orphaned wild animals that are brought to him from around the area. He has one bear named Rose who he raised as an orphan and was released to the wild that returns from time to time to see him. This year when she came, she gave birth to two cubs. Joel locks her up if it is hunting season to protect her. This is her third litter. Contrary to what wildlife agencies put out about interacting with wildlife, Joel interacts successfully and continues to prove their theories wrong. Here is a post that Joel made on his Facebook page. Around the world there are thousands of wildlife biologists who have been taught that the only way for humans to study wildlife is from a distance and without contact. The theory is that animals will react differently if humans are present. This “theory” extends to the concept that any contact between wildlife and humans “makes” the animal fearless of humans and therefore a direct threat to becoming at the very least a nuisance if not dangerous. The saying “ A fed bear is a dead bear” is used all the time. And indeed almost any bear who comes in contact with humans is killed. The false narrative continues by saying that an animal hand raised by a human becomes dysfunctional and dependent on humans. And should any wildlife biologist dare to integrate themselves into a population of wild animals to study them that biologist is immediately condemned and criticized for life by the academics who really know nothing about wildlife. Fortunately, there have been notable examples to demonstrate the hollowness of this dogma. Some noted examples are Jane Goodall, Joy Adamson, Diane Fosse and Lynn Rogers. It is noteworthy that three on this list are women. Each has shown us that once an animal or an animal population becomes so familiar with the presence of a human that animal population just carries on as if the human was not even there. And in everyday life there are dozens of wild animals that have integrated themselves everyday into our very urban lives often without our even noticing. Raccoons, skunks, foxes, and even coyotes, deer and mountain lions are examples. So, that brings me to POVF and Joel Rosenthal. No one tells me how to handle, rehabilitate or interact with any wild animal I get. This gives me the flexibility that almost no other facility around the world has. And as all of you know I am a “hands on” fellow. This has allowed me to learn so very much about the real mannerisms, traits and even thinking that an animal does. There are hundreds if not thousands of people who have foxes as “pets.” But those foxes are not permitted to be wild. I, on the other hand, have this relationship with a wild fox, Mink, who comes and goes, hunts, mates and has her own offspring. Yet, because I am simply background noise she carries on her unadulterated wildness right in front of me. Over the years I have now had 30 bears. All of them received personal attention most for as long as 18 months before they went off on their own. None has attacked a person. None has raided a house or cabin. None has spent their life begging for food. None has become a nuisance. And then of course there is Rose from whom I have learned so very much about bears. She is nine years old now and has survived all this time by avoiding humans when she is in the wild. She has claimed the territory around POVF as hers. Yes, she does come into my house, but has never tried to enter anyone else’s. Yes, she looks forward to the snacks I give her, yet she has never approached anyone else for food. So why are we humans still so very ignorant and stupid about the very essence of what a wild animal is all about and how they think. Why is it that students today are still taught so much nonsense and false information about wildlife and how to study and understand them? about Florida’s natural resources as he appointed developer Carlos Beruff to the FWC Commission. and not with preserving them in order to abuse them or kill them, have been trying to clean up the FWC Commission from the likes of wealthy developers. after he voted to approve a friend’s plan to destroy precious wetlands in order to build a home. His developments have been accused of moving an eagle’s nest without permission and destroying public conservation areas. He wrangled the state wetland-mitigation system so he could plow down 40 acres of mangroves just so he could have a better view of one of his properties. This guy is just bad news. He has been accused of lying under oath to the Florida Department of Law Enforcement investigators. He also avoided paying $235,000 in taxes by claiming that he was a farmer and a lumberjack. What uncovered other things has he done, I wonder? drove as safely at that speed as lesser expensive cars do at lower speeds. He lost his license. Constitutional Revision Commission, and others. But of course, Scott loves wealth. Beruff seems to make it a point to vie against those who wish to preserve Florida’s natural resources. What kind of voting and mulling around is he going to do on a commission that involves our fish, wildlife and precious land? I think you can figure it out. We have seen what other developer commissioners have done and how they have voted against the best decisions for Florida. Thankfully several of them finally resigned. Who they have been replaced with is not any better and so if we as Floridians want to preserve Florida for our grandchildren and their children, it is our obligation to fight against such actions and stop them from destroying this beautiful state.